The participation and proficiency rates for Algebra I for Latinos in Sunnyvale, in the heart of Silicon Valley, is well below the already low statewide average. Sunnyvale is not alone among the 54 school districts in Santa Clara and San Mateo counties, which form Silicon Valley. The data for Latino and African American students “paints an alarming picture about the future for so many of these children. That’s the promise that we, as a community, have broken,” concludes the report “Broken Promises: The Children Left Behind In Silicon Valley,” released Wednesday by Innovate Public Schools, a new organization funded by the Silicon Valley Community Foundation and the Walton Foundation, which promotes charter schools and parental choice. The report, by journalist Joanne Jacobs, focuses on Academic Performance Index scores, algebra proficiency rates by 8th grade, and the percentage of students who graduate with the courses required for admittance to the University of California and California State University by district and by school, drawing attention to those with the best and worst performances. 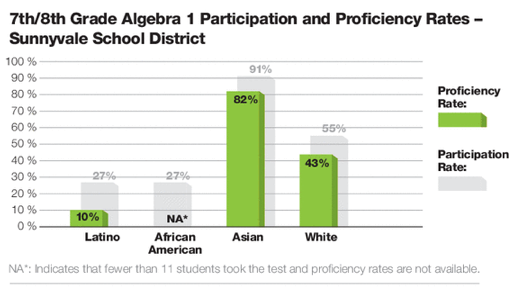 There are also vast disparities in enrollment rates in algebra. In San Jose Unified, 22 percent of Latino children were proficient by 8th grade, but 90 percent took the course; in Santa Clara, 11 percent were proficient, while only 22 percent took the course. In largely low-income Gilroy Unified, one of the more successful districts for algebra, 38 percent were proficient, with about 60 percent taking the course. A number of recent studies (here and here) have shown the harm from enrolling students in algebra unprepared; only about one out of six students who repeat algebra end up scoring proficient the second time around. But holding students back until 9th grade is no assurance they’ll do better either. Most of Sunnyvale’s students enroll in two high schools in the Fremont Union High School District, where only 11 percent of Latino 9th graders in Algebra I scored proficient, according to the report. And studies have concluded that some districts should have been assigning more Latino students to algebra earlier. Good teaching in early grades is critical. The promise of the switch to the Common Core standards is that students will have a better grasp of fundamentals before taking full-blown algebra, most likely in 9th grade. What’s unclear is the impact that taking algebra in 9th grade will have on students who want to major in STEM in college or attend a UC school; unless they double up in high school, they won’t have taken calculus before graduating. Some Silicon Valley districts – particularly those with parents in high tech – will likely continue to encourage Algebra I in 8th grade. The report raises the question of whether the gulf in math achievement among underserved minorities could widen under Common Core. There are middle schools whose Latino students far exceed the averages for algebra proficiency, elementary schools with high APIs and high schools that excel in preparing Latino students for four-year college. Many are charter schools, like Rocketship’s K-5 schools in San Jose, KIPP Heartwood middle school in the Alum Rock school district in San Jose and Summit Preparatory High School in Redwood City. Alum Rock, long considered an academic backwater in East San Jose, has four of the five middle schools with the highest Algebra I proficiency rates for Latinos, including two semi-autonomous schools that the district started under parent pressure, and ACE Charter School, which recruits struggling students out of elementary school. The fifth middle school is in Gilroy. The report calculated the percentage of students completing the courses, known as A to G, required for admission to UC and CSU campuses, based on the four-year graduation rate. Source: Innovate Public Schools. The report calculates the A-G completion rate using the four-year graduation rate, based on the cohort that entered 9th grade, reflecting dropouts along the way; the state calculates the rate based only on the senior class, a higher rate. 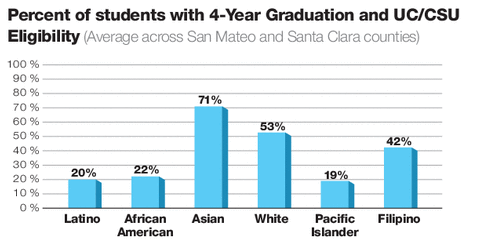 The Silicon Valley four-year rate with A-G completion for Latinos of 20.2 percent (combining 26 percent in San Mateo County and 15 percent in Santa Clara County) is 0.3 percent less than the statewide average, according to Innovate Public Schools. Here, too, six of the top 10 high schools for Latinos are charters, along with four district schools (Jefferson High in Jefferson Union, Lincoln High in San Jose Unified, Half Moon Bay High and Capuchino High in San Mateo Union). The report profiles three of the high-achieving schools and outlines strategies that others use. Summit Prep, for example, assigns to every student a mentor teacher who serves as college counselor, coach and advocate; struggling students get extra help during two month-long intercessions. But for many Latino students, the report says, ambitions are cut short, starting when they fall behind in reading by third grade and math in middle school. I live and teach in Sunnyvale. Melodramatic headlines aside, this is a real problem…but we need fewer studies and more plans for improvement. I wonder, though…how do you get “statistics” on the test results of kids in “Silicon Valley”? There is no such place. If you mean Santa Clara County, say so….accuracy matters. One other point: The reason that charter schools are so successful in bringing up test scores is simple: 100% of their students have parents who care enough about their childrens’ educations to enroll their kids in a charter school. They also impose admissions criteria and processes of their own choosing, unfettered by oversight or accountability. This is a bit of a literary fail, because you expect the outcome to be that Marita’s friend goes to KIPP and succeeds, but actually Marita indicates that she is no longer friends with the girl. So Gladwell makes it clear how some of the selection process works, apparently without realizing what he’s revealing, while attempting to portray the magic feather. I usually admire Gladwell, but he was unusually uninsightful here. San Jose has new community centers. Why not encourage retired senior citizens, who are former engineers and other professionals to mentor these students. Resources untapped. The city of San Jose ran a program at the local high schools that did exactly what you are suggesting. It does need coordination so that students and mentors show up at the expected times. With the financial crisis the program was terminated because there was no longer money to employee the person who coordinated the program. By how much did wage and benefit spending per year of experience per FTE administrator rise in those years at SJUSD, Paul Muench? And how did SJUSD choose to spend “flexed” categorical money? There’s no question that money is tight, but claims that generalized budget cuts forced the elimination of specific positions are ideological. Many school districts have continued to increase administrative salaries and/or to employ at least a few useless district office administrators — full-time superintendents in small districts, deputy superintendents, curriculum coordinators, intervention directors, and others who don’t produce any specific work. Whether these conditions apply in San Jose, I don’t know, but the point is that districts had choices about what to cut. I was only a volunteer. Although I believe it was strictly city funding because one of the council members came to visit the program just before the funding was cut. To believe that taking calculus and having a high AP “grade” will ensure that the student will get into a STEM program and then skip the intro to calculus class(es) is to live in error. I know for a fact that UCLA will make all students retake calculus. Why? Because they do in one quarter what a high school does in at least one semester and, often, in two. You can interpret this in two ways: 1) the UCs believe that high school calculus is not rigorous enough to meet college requirements, or 2) they want to put every STEM student through the wringer and see how many of them stay in the majors. It’s a weeder course, folks, not that much different than the chemistry courses pre-med majors put up with. In regards to the charters being more successful, well, this is toward the end of John’s article: “Summit Prep, for example, assigns to every student a mentor teacher who serves as college counselor, coach and advocate; struggling students get extra help during two month-long intercessions.” Well, duh! Can the public schools make this available to every student they have? They can barely get the money to keep the teacher-to-student ratio below 40 (if they are lucky), where are they going to get the resources to assign an individual mentor to each kid? Manuel, good point about counselors. One of the East Bay school districts where I taught eliminated its middle school guidance program completely, a few years ago. Another maintains a ratio of 1 counselor to 500 high school students. I’ve always been of the belief that students and parents need to inform themselves about Grade 6-12 course options, university, community college, or apprenticeship admission procedures, and financial aid — incidentally, much easier to do today than it was for me 20 years ago, pre-World-Wide Web. Nevertheless, when counseling resources drop to such low levels, students lose an important source of support. Dorethia, your mentorship idea makes sense, especially in a region like Silicon Valley, where there is a concentration of technical workers and, by extension, retirees. Shifting from personal voluntarism to corporate involvement, it amazes me that high-tech. companies are not creating direct pipelines for high school students. Summer employment would seem to be a mutually-beneficial arrangement. Companies would have to look beyond the “top students” who, just as I did, will naturally find tech. employment opportunities in high school. To make a difference, companies would have to develop entry options for students with average, or even low, academic performance. That is the point at which our specialized, regimented, and still-prejudiced society begins to throw away human talent. Manuel: You raise an interesting issue regarding UC’s admission standards for engineering and other STEM majors. You need to have taken calculus in high school, as Joanne Jacobs pointed out, but then students are required to take it again (my daughter among them) as freshmen. I also had the feeling it was a way of filtering out students; it had that effect anyway (though not for my daughter). Regarding Summit. A reminder that charters are public schools, and that Summit relies on the same per student funding (actually less so, for many charters) as district schools. From my observation, Summit is an efficient operation that builds strong relationships between students and teachers. Larger comprehensive high schools will have difficulty duplicating that model. There are trade-offs. Apologies for the tangent John, but you brought it up. I challenge the claim that charters do it with less money. First off, most of the per-student funding in ‘traditional’ public schools is concentrated in only a few schools, and at the expense of the rest of them, since the overall number is an average. Also, a large amount of ‘district’ overhead does not contribute to the function of schools, rather to satisfying some state or federal mandate for accountability or reporting or similar (things charters are often explicitly exempt from no less). I think it is instructive to look at the per-pupil funding that actually makes it to the schools (this information is included in SARCs, which every public school must publish). You will very quickly realize that the programs that the kids actually get are grossly underfunded when compared to charters. Furthermore, charters invariable raise much more private money, sometimes even multiples more, even with the ‘comparable demographics’. One can argue all day about average state and federal funding levels (which is what ‘studies’ tend to do), but if one actually cares about understanding what the kids in the schools get in terms of funded programs and resources, charters win hands down. Some charters that serve primarily low-income, minority students do fund-raising from wealthy donors or foundations(for college trips and technology) but it is not extensive; they also are not entitled to parcel taxes. The few that do big fund-raising (Bullis in Los Altos, where it does not get the district’s basic aid) and Pacific Collegiate in Santa Cruz are the exception. See, there we go again. LAO’s analysis is between charter schools and school districts not between charter schools and the actual traditional public schools. This is a critical distinction. One I also made in my comment. They also caveat their findings with the statement they are only including governmental sources, and furthermore, explicitly caveat their lack of addressing special education differences (which can be enormous, if not only for encroachment). Look at SARCs. the differences even between different traditional public schools can be striking. Its kind of ironic that financial data isnt really transparent for charters either. Anyway, the story is much more complex than saying charters have to live with less money. And in my opinion, is even inaccurate when viewed from the resources kids get, which is what I think makes sense as a basis for comparison if you’re talking about the value of such resources. Navigio is right to compare school to school dollars. In Santa Cruz, where Pacific Collegiate is located, few of the $3,000 per child per year the school pressures parents to give actually make to the students. Year after year, the bulk of that money has accumulated in cash reserves to the point where the school is carrying a nearly 90% reserve (ed code requires charters to carry a 5% cash reserve). When you look at what is actually spent to operate the school, they are able to meet all of their obligations with state and federal funds, including their annual lease payments for the school site. Now factor in the reality for the other schools in Santa Cruz that serve low income, English Language Learners and students with special needs. Of the revenue they receive for every general ed student, $1300 comes off the top to meet the costs of special education services — costs that are not incurred at PCS, which has very few and only light need special ed students. Once you add in the the general fund draw for transportation, food service and accountability measures, the students in regular schools are receiving far fewer classroom dollars than their charter school friends by the sea. It’s lazy to repeat the “charter schools do more with less” mantra. Parse the details and you’ll find it’s just not so. Every charter in San Francisco Unified is in the *philanthropy flowing in from the Gates Foundation etc. * or *parents expected to donate large sums* category. (Actually — correcting myself — there’s one that may have fallen off the Gates-philanthropy radar, where it used to be. It’s the one the CCSA recommended closing a year or two ago.) I don’t know of any (anywhere) that aren’t in either category — do you, John? Are you saying that Summit is in neither category? Caroline: Summit reports that it does not raise money for operational expenses. It does raise money for start-up costs of new schools, and Gates is funding part of the start-up costs of its new grade 6-12 school, Summit Denali, which will open in Sunnyvale this fall (based on the story, would appear the right district, doesn’t it?) Once schools are have reached full capacity (grades 9-12), the schools operate fully on state payments. Rocketship and, I believe, Aspire, have the same model. Summit says its parents do fundraise for additional special programs and trips at their school. As far as I know, Gates funds startup costs for some charters and in blended learning (software, startup costs) but not ongoing operating expenses of charters. Rocketship has a big “our partners” page listing all the usual suspects — NSVF, Walton, Gates et al. One of the keys to creating change in public schools is the support of donors. Aspire Public Schools would like to thank its many investors for their time, energy, services and financial support. Summit just has a “donate to us” page, as far as I can tell. We had David Kirp come to a recent conference we sponsored to discuss the finding outlined in his latest book: Improbable Scholars. The kinds of educational renewal efforts he highlights are those that should be studied by all who are concerned about education. The districts successful in narrowing, if not closing, the achievement gap utilize virtually none of the prescriptions of the self-styled “reformers.” There’s no turning schools over to private charter school operators, no mass firings of teachers and administrators, no Teach for America, and no “turn around strategies.” It’s a dynamic and creative curriculum created by the teachers who use it, high quality professional development, stable leadership, community resources focused at school sites, and parent outreach that includes parents in the communication loop and supports them as parents without trying to turn major educational decision making over to non-educators. Seems there are many paths to better outcomes. The report is light on the hows, but at least there are some characteristics that are different between the different charters. Add the schools that David Kirp highlights in his new book into the mix and there are even more paths to better outlcomes. So with all the options for better outcomes, does it really come down to leadership? Some group of people willing to take some risks and engage in the hard work of continuous improvement. From the outside looking in it sure seems that’s the spark that lights these fires. Paul and Gary: Early next week, I will be posting a terrific interview I had with David Kirp regarding his book. But Gary, I don’t see where your attacks on “reformers” deal with the issues raised by the report of Innovate Public Schools and the huge disparities in outcomes in districts like Sunnyvale, which have known for years about the poor performance of its low-income, minority students. Good points and info, CarolineSF, thank you. I’m coming from the Adult Ed angle… and I’ve been pondering how Brown’s new place specifically excludes Older Adults and Parent Ed from new funding. Kids are raised by families not schools. Many other cultures expect schools to provide rigorous academics and families to provide strong social and emotional support. We’ve been veering toward opposite expectations for many years now. Families matter. So do communities. Yes, it’s hard and messy and complicated and what does that “look like” etc. But… just starting with that truth… is very powerful. Strong industry can provide money. Strong families and communities make the sure the money is not spent on prisons, juvenile detention centers, and rehabs. We have a lot of money. We actually have very strong industry in CA – much stronger than in many other states. But a lot of money goes to dealing with problems that being with deep suffering in families and communities. The cost of the prison system is pretty dumbfounding. So… do I have all the answers? No. But given how low-cost Adult Ed is… and what a small portion Parent Ed and Older Adults Programs are of it… and what an important rudder families are to children and the state at large, I sure as heck don’t understand cutting it. Last thing: I am NOT saying the families of these particular children are not supportive, caring families. I don’t know all the factors at work here. I do know that it is stressful to focus on family life in our culture. I see it all the time – in my life, in lives of my students, in the lives of pretty much every parent around me. Our culture is not about family life. It’s stuck somewhere between 17 and 28. It’s about ambition and independence. It’s not about interdependence even tho’ primates are and we are them. I agree, Cynthia, and I think schools can really play a role in knitting people into the community. I would love to see all schools offering parenting classes and/or parenting get-togethers for toddlers in the neighborhood, to help people meet their neighbors and their kids’ classmates and to make school a place parents come and where there are community resources available. Again, I think EdSource Today needs to avoid reporting on advocacy written by partisan sources as though it were impartial research. Fine, cover the report, but don’t portray it as though it were impartial and scholarly. Disclose disclose disclose. It’s my sense that even among college-bound kids that a substantial portion, perhaps even a majority, don’t enroll in any math class their senior year. IMHO, this is much more limiting than kids not taking algebra in 8th grade. You don’t need calculus in HS. You probably do need 12th grade math. The headline on this piece really bugs me, that schools are “crushing aspirations” of these kids. I doubt that is the case: I suspect the problem is that the kids in question don’t have aspirations to work for those high tech companies. IME, even the “worst” public schools actually are very good at supporting kids who want to learn and are self-starters. (With a caveat that peer pressure can sometimes crush kids who stick out that way, and it can be hard for adults to combat that.) The problem is how few kids come to school that way in the first place. The A-G requirements include three years of high school math, correct (which as the parent of a 2012 high school graduate I’m pretty sure of)? My kids met them with advanced algebra, geometry and trig, and between them were admitted to UCLA, UC Santa Cruz, SFSU, SJSU, CSU Northridge and CSU Long Beach. I must note the nonsense about algebra and the Common Core. Not actively encouraging 8th-grade algebra does not mean actively “discouraging” [p. 9] it. Yes, the state will no longer give schools extra credit for 8th-grade algebra test scores. This restores 8th-grade algebra and 8th-grade general math to neutral positions. This is hogwash. Neither UC nor CSU specifies calculus as an undergraduate admission requirement. In response to a different article, I looked up the specific admission requirements for a math major at CSU a few months ago. Even math majors are routinely admitted without high school calculus! It’s much easier to set our sights on mythical milestones such as 8th-grade algebra or 12th-grade calculus, and to extol charter school models that might not be repeatable across the entire public school population, than to focus on what kind of instructional experience is offered in the classroom, and what kind of effort the students (and, by extension, their families) actually invest. If you read the California draft framework for Common Core implementation, it does actively discourage what it calls “acceleration,” which means pre-algebra in 7th grade and algebra in 8th, for all but the very best students. The A-G courses are the minimum standards set by California’s state universities. The report distinguishes between the “STEM university track” and the “college track.” Students who “aspire to a university degree in a STEM field,” such as engineering, need more advanced math than students who plan to major in humanities or social sciences. Even with good grades, high test scores and an A in AP Calculus, it’s very hard to get into the good engineering programs that provide a shot — not a guarantee — of a high-tech Silicon Valley job. It’s exceptionally difficult to do the minimum in high school and get on the high-tech track in college. The report is by Innovate Public Schools, which explains its mission — it favors innovation in public schooling! — in the introduction. All data comes from the state Education Department. Was I paid to write the report? Yes — or I will be once I remember to send the invoice. Do I support education reform? I don’t support every proposed reform strategy, but I think we need to work harder and more creatively to improve public schools, especially those serving the neediest students. I believed that when I wrote for the San Jose Mercury News and I continue to believe it now that I’m a blogger (joannejacobs.com and ccspotlight.org) and freelancer. I would assume it was a given that you were paid to write the report. My point was that if you otherwise derive income from sources advocating “reform” policies such as charter schools — in a highly charged situation in which opinion is extremely divided over those policies — that needs to be disclosed, rather than EdSource Today’s treating your work as impartial research. Your other work makes your highly partisan positions on controversial issues clear. A second dirty secret: you don’t have to have a degree in engineering to get a high tech computer-oriented job; you have to have demonstrated skills in programming. It’s not necessarily the same at all. Also, I love how “engineering programs so impacted that only the creme de la creme of students are even allowed to attempt one” and “omg, not enough American kids are pursuing STEM training, we’re going to have a shortage” so wonderfully coexist. I don’t mean to pick on you exclusively for that; it’s endemic. I’m not a big social justice guy, but I think you have to be a little dead inside think this is okay when talking about children who have no choice when it comes to where they live. All that being said. Inequity in the valley between schools in East-side San Jose and say Palo Alto are stunning. One does not have to look very hard to see the disparity in teacher salary, class size, science/technology/arts/liberal studies programs, field trips, Internet access, 1:1 initiatives or school-sponsored after-school programs. There’s nothing new here, and I don’t think it’s about curriculum. The idea that Common Core will create magic for these kids ignores decades of history through various curricula and only relatively minor changes in achievement. What can we do to build connections between home and school? What can we do to get these kids thinking as third and fourth graders about how great it would be to work at Yahoo! or Apple? How can we get their parents thinking that way? How can we integrate the community not just into the well-being of the kids they know personally but also into the well-being and education of kids that they don’t? Also, there should be a disclaimer that author Joanne Jacobs is an open, avid advocate of charter schools and other “reform” policies. I don’t know if she derives income from “reform” sources, but that information might be relevant as well. As to the success rates of the charter schools mentioned, their selectivity and attrition rates are often a subject of intense debate.